Tom Volf's MARIA BY CALLAS is the first film to tell the life story of the legendary Greek/American opera singer completely in her own words. Told through performances, TV interviews, home movies, family photographs, private letters and unpublished memoirs-nearly all of which have never been shown to the public-the film reveals the essence of an extraordinary woman who rose from humble beginnings in New York City to become a glamorous international superstar and one of the greatest artists of all time. Assembling the material for the film took director Volf four years of painstaking research, which included personal outreach to dozens of Callas's closest friends and associates, who allowed him to share their personal memorabilia in the film. When recordings of Callas's voice aren't available, Joyce DiDonato, one of contemporary opera's biggest stars, reads her words. "The least we can do is enjoy the fruits of her sacrifice, her rich and enormous legacy of live and studio recordings. 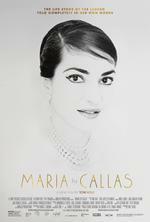 MARIA BY CALLAS is a forceful reminder and an invitation to do that." "An aching compilation of a woman branded as difficult yet adored as one of operas' biggest stars in the 20th century." "MARIA BY CALLAS expertly presents an emotional essence of this performer, leaving you both shaken and stirred by the extent of her gifts and the way they connected to both audiences and her tumultuous life." "What emerges is a portrait of a woman of extraordinary natural gifts and work ethic, who was pressured to become a superstar by her mother and then her husband, instead of a conventional homemaker and mother."